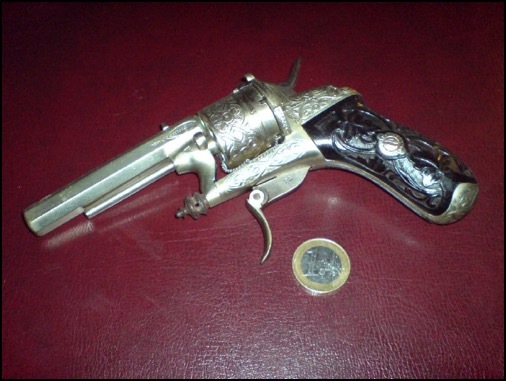 Dutch gun legislation allows the possession of certain antique firearms without license. Exempted are all muzzle loading black powder arms and some arms loaded with cartridges. All weapons chambered for pinfire cartridges are exempted. The pinfire cartridge was invented by Casimir Lefaucheux (1802-1852) and he was granted a patent in 1835. An enormous diversity in pinfire arms was invented and produced in a relative short period: (hunting) rifles, revolvers, pistols and combination weapons (firearms in combination with a knife or knuckle duster) in many calibers. This website is exclusively concerned with the collection and restoration of pinfire handguns. Engraved Chamelot & Delvigne Revolver, 7 mm.